Hingham Massachusetts The Massachusetts State Police Bomb Squad responded to a call of a grenade at Linden Ponds, a continuing care retirement. Family members found the grenade during a visit with their 95-year old relative who lives at the facility. The family member reportedly moved the grenade outside away from the buildings and other residents before calling the police. The bomb squad determined that the grenade was an inert replica. Authorities checked the apartment unit for other potentially dangerous items but no other items were located. Although it did not contain an hazard, the resident turned over the replica grenade to the bomb squad for disposal. Loweswater, United Kingdom a man clearing out an old storage shed on his rural property called police after he found six sticks of dynamite and six detonators. Two of the dynamite sticks were in a wooden box alongside the detonators, which were in a small tin and wrapped in a newspaper dated 1901. Police responded and cordoned off the area and before taking photos to send to a bomb disposal team based in Catterick. The bomb squad instructed personnel not to handle or move the items as they prepared to send a team to respond. The bomb squad arrived and carefully relocated the items to a hole they dug in a nearby field away from the farmhouse. The items were safely destroyed in a disposal shot. Hurlock, Maryland Police responded to call from a resident who reported finding over 3 dozen hand grenades while collecting recyclables near a road. The State Fire Marshal office reported that 38 grenades were recovered in all including 9 that were live. Of the remaining, 19 had a fuse but no explosive filler and 10 were inert. The State Fire Marshal bomb squad safely disposed of the munitions with no injuries or property damage reported. Authorities are conducting an investigation to determine the origin of the grenades and the circumstances regarding their disposal on the side of the road. Weldon Springs, Missouri When authorities were called in to calm down a potentially suicidal man in Weldon Springs, they found another dangerous matter at the scene. Following a brief standoff, after which the man was subdued, police found a potential UXO inside his vehicle. Local businesses were evacuated and the surrounding area was cleared. The St. Charles County bomb squad along with the Bureau of Alcohol, Tobacco, Firearms, and Explosives and FBI bomb squads worked together on this incident. They believe the UXO was possibly a WWII bazooka round. The ordnance was taken care of by the combined EOD teams, and the area was opened back to the public. Richfield, Utah A local resident was combing through her elderly father's belongings when she came across some old ordnance items. She rightfully contacted authorities immediately. 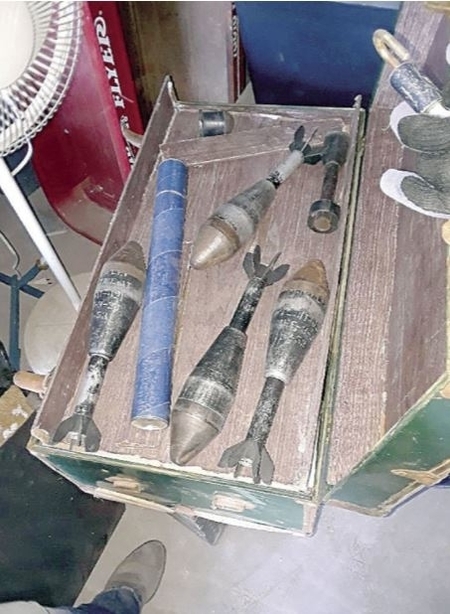 Youngsville, Louisiana During a narcotics raid, the SWAT team responding was surprised to find what appeared to be military ordnance. Identifying the danger potentially present, the SWAT team cleared the area and called the bomb squad. An EOD team, the ATF, and the Louisiana State Bomb squad all arrived on scene to provide support. EOD identified the item as an M7 WWII military rocket. The item was reported to be empty / inert. New Carlisle, Ohio The New Carlisle Fire Chief praised a homeowner for doing the right thing when she found what she believed to be an explosive device while cleaning her basement - she immediately notified authorities. The Clark County sheriff's bomb disposal team responded to remove the item which was determined to be a stick of dynamite. Bomb squad personnel safely removed the dynamite from the house and transported it in a dump truck full of sand to a nearby field where it was safely counter-charged.